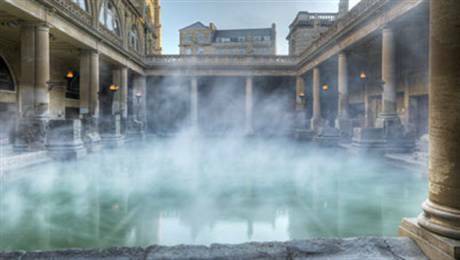 Bath is one of those places in the British Isles that you simply have to visit. A World Heritage Site since 1987, I'd challenge anyone to resist falling in love with this stunning city. To be honest 24 hours is not nearly enough time to explore all that bath has to offer from its world famous baths, varied architecture, immaculate open spaces, restaurants, bars and pretty exemplary high street. Bath is full of surprises and on a recent trip I discovered a few more to add to the list. For a flying visit you'll struggle to find a better B&B to bed down at than The Griffin. Bath certainly has some fabulous five stars to sample, however, this Grade II listed pub is in an incredibly quiet spot and just a stones throw away from the city centre. There are five double/twin rooms and three singles all stylishly decorated in warm chocolates and serene neutrals. The rooms are all ensuite and very well appointed with iPod docks, flat screen TVs and the sort of touches that you would expect from a boutique hotel. At breakfast there are a selection of newspapers, superb poached eggs and endless pots of tea; simply all that is needed to face the day ahead. I would suggest any visitor to Bath seeks out the restaurant "Sotto Sotto" located on The North Parade, a few moments from the baths. My favourite food is Italian food and I can genuinely say that I have never experienced anything like this outside of Italy. Unassuming on the outside, walk down the basement steps and you will reach a cavernous paradise, a gastro-Nirvana. There is no formality at Sotto Sotto, traditional Italian hospitality takes over and it is easy to spend a number of hours over lunch or dinner. Everything I ate was delicious, the tuna tartare light and fresh, the calamari crisp and succulent, the lamb cooked to perfection and the Tiramisu, mouth-wateringly good, even when you feel that you can't eat another thing. Wines can be paired to your dishes as the sommelier has an excellent and varied knowledge of traditional and new world wines. The Champneys group have recently opened a "Day Spa" in Bath on New Bond Street. Unlike a Champneys Resort these are aimed at those who are looking for a little luxury but who are limited on time. Book in to experience massages, facials, manicures, pedicures and tanning treatments. The day spas are not just for girls, there is also an extensive menu of treatments for men and a well stocked shop of the products used. Throughout the year there are special offers and events, this month you are able to book an Elemis Super Facial for £29.95 and receive a gift to a similar value.